“Constitutional carry” has been discussed quite a bit recently in the news and on social media. GCO also receives occasional inquiries about. GCO is therefore posting this article for the benefit of its members and readers. A discussion of constitutional carry should begin with a definition of what it is. There is not really a commonly accepted definition, even by those who advocate for it. Many use the phrase to mean carrying a weapon without the need for a permit, which might more aptly be called “permitless carry.” Permitless carry focuses on the lack of a permit, regardless of any restrictions that might exist on where or how one can carry. Still others use the phrase to mean a combination of both permitless and unrestricted carry. Probably the phrase is used most often in Georgia to refer to permitless carry, and the current HB 2 sponsored by Rep. Matt Gurtler (R-Tiger), which Rep. Gurtler calls “constitutional carry,” is permitless carry. The bill retains all present off limits locations. For that reason, this article will use permitless carry as the definition of constitutional carry. The name “constitutional carry” derives from a theory that the government may not require a permit to exercise a constitutional right. That theory is no doubt attractive to many in the Second Amendment context, but it has very little legal support. It is well established that the government may require a permit to exercise a constitutional right, even a fundamental one. Every state in the union requires a license to marry, even though it is well known that adults have a constitutional right to marry. The Supreme Court recently re-affirmed that right in Obergefell, the “gay marriage” case. The court did not, however, say that states must allow gays to marry without a license. It said the states may not deny a marriage license on account of being gay. That is, the licensing regime is fine as long as licenses are readily available. Similarly, governments may condition parades, demonstrations, and rallies, well-recognized First Amendment activities, on first obtaining a license. Thus, calling permitless carry “constitutional carry” is at best a misnomer, at worst a public relations ploy designed to convince constituencies that permitless carry is a constitutional right. It is not. Nevertheless, permitless carry is attractive to many gun owners. GCO has been advocating for permitless carry since its inception. It became apparent early on, however, that the biggest issue in Georgia was not that a license was required to carry. The biggest issue was that Georgia had so many places off limits. Arguably, when GCO began, Georgia had more places off limits than any other state. It did not matter whether a license was required or not. Even those with licenses were disarmed almost everywhere they went. GCO therefore concluded that, while continuing to advocate for permitless carry, it made more sense to put GCO’s limited resources into trying to eliminate off limits locations. GCO has been very successful in that endeavor. Perhaps the single most important change GCO’s efforts have brought about was the repeal of the “public gathering” law, which made it a crime to take a firearm “to or while at a public gathering.” That law made it all but impossible for a law-abiding citizen to carry a firearm in any meaningful way. In addition to eliminating the public gathering law, GCO has successfully lobbied to eliminate from the off limits locations restaurants that serve alcohol (at first one could carry but not consume, but then GCO removed that restriction as well), bars, churches if the church allows it, government buildings, polling places when elections are not taking place, parking lots of off limits locations, public transportation including MARTA trains and stations and airport terminals, college campuses, and the 1000-foot school zone surrounding school property. GCO also was successful in eliminating the requirement to carry in a holster, repealing the crime against carrying a concealed weapon, and carrying knives. In addition to the drastic reductions in off limits locations, GCO undertook to improve the licensing process, since it was apparent that permitless carry was not to be a reality soon. GCO has reduced the time to issue weapons carry licenses, required issuance to eligible applicants, added a private right of action against probate judges who fail to issue licenses, expanded statewide preemption, added a private right of action for preemption violations, and provided for damages to those aggrieved by preemption violations. For those who desire permitless carry, GCO’s efforts also have resulted in it now being legal to carry knives with blades under 12” without a permit, as well as certain handguns. Despite some reports to the contrary by Patrick Parsons and Georgia Gun Owners (who have never successfully introduced and passed any bills), GCO continues to support permitless carry, including the current bill as of this writing, HB 2. It is important to note, however, that HB 2 does nothing to eliminate places off limits for carrying firearms. Because the vast majority of GCO’s members have weapons carry licenses, eliminating the need for those licenses without expanding carry rights otherwise would be a bit of a hollow victory. Most members would retain a license for reciprocity purposes, and because the license acts as an alternative to the NICS check when buying a gun from a gun store. AK: Their permitless carry bill in actuality was just a repeal of their concealed carry law. GA already has repealed its concealed carry law, so we have that. Instead, AK created a requirement to notify law enforcement that you are armed if you encounter an officer and allow him to secure it during the encounter. It also requires you to obtain affirmative permission from a private property owner. AZ: Also just repealed its concealed carry law. A permit is still required to carry in a restaurant that serves alcohol, so AZ has not really gone permitless. AR: Still a crime to carry concealed without a permit. Their “permitless carry” bill only applied to open carry. MS: A permit is still required for some forms of carry (e.g., particular hidden body locations). Thus, permits are still part of the regulatory regime. Cannot carry in restaurants that sell alcohol, in unsecured areas of airports, in churches, in private property that is posted, or while in a parade. MO: Local governments are not covered by preemption for open carry, so they have the power to require a permit. Cannot carry in government buildings, restaurants that sell alcohol, colleges, child care facilities, sports arenas, hospitals. ND: In addition to the residency requirement (of at least 1 year), carriers must have a state-issued ID for at least one year, must notify law enforcement on contact. Non-residents must have license to open carry. And the foregoing only applies to concealed carry. A license is required for open carry of a loaded handgun. Must produce license on demand of law enforcement. Cannot carry in restaurants that sell alcohol, at public gatherings. SD: Cannot carry in bars. While GCO believes permitless carry is a laudable goal, it will continue to prioritize reducing the everyday burdens of carry firearms, rather than eliminating the need for a license that most members already have (and will continue to have for purposes of reciprocity and NICS alternative). Chatham County Probate Judge Thomas Bordeaux has filed a motion with the Court of Appeals of Georgia, seeking sanctions against GCO for filing a “frivolous appeal.” The motion apparently was filed in retribution against GCO because GCO sought to force Bordeaux to follow Georgia law in issuing GWLs in the time required by statute. The motion comes on the heels of Bordeaux’s motion in the Superior Court of Chatham County for an award of attorney’s fees against GCO for suing Bordeaux in the first place. The motion, and GCO’s response, can be found here. ​GeorgiaCarry.Org proudly endorses Brian Kemp for governor. We believe that Brian, as a lifelong supporter of our Second Amendment rights and a Life Member of GeorgiaCarry.Org will protect and defend the Constitution of the State of Georgia and the United States on all rights, not just a few of them. He strongly believes in the preservation and restoration of our Second Amendment rights and the protection of our due process rights enumerated in the Constitution. Our due process rights are also under attack along with our right to keep and bear arms. Many states have passed legislation diminishing due process rights and we have had several bills introduced here in GA to do the same. Without due process, we have no rights at all. Therefore, we are endorsing Brian Kemp to defend and protect those rights as Governor of the Great State of Georgia! GeorgiaCarry.Org proudly endorses David Ralston for House District 7. As Speaker of the House, David has always supported our Second Amendment rights and, in many cases was the difference in our legislation being passed into law. He strongly believes in the Second Amendment and due process rights. We sincerely believe he will stand with us against any attempted erosion of our rights in the future. GeorgiaCarry.Org proudly endorses David Shafer for Lt. Governor. As a Senator and President Pro Tempore, David has always supported our Second Amendment rights and, has carried several good gun bills in the Senate in the past. ​​​​GeorgiaCarry.Org ​strongly ​opposes Hunter Hill in Governor’s Race! In 2014, after HB875 had passed the House, it was sent to the Senate Judiciary Committee. Hunter Hill was a member of that committee. He and two other Senator introduced a substitute that gutted the bill. In fact, when it came time for the committee to vote on HB875, Senator Josh McKoon stated that this was no longer a Second Amendment bill that he could support and was the only Republican on the committee that voted against the bill. Hunter Hill voted for that bastardized substitute, which he now uses to back up his support of the Second Amendment. This Judiciary Committee move was the reason that HB60 was amended to reflect HB875 and sent back to the Senate for a floor vote. Again, Senator Hunter Hill was involved with inserting the church carry provision that we are stuck with today. 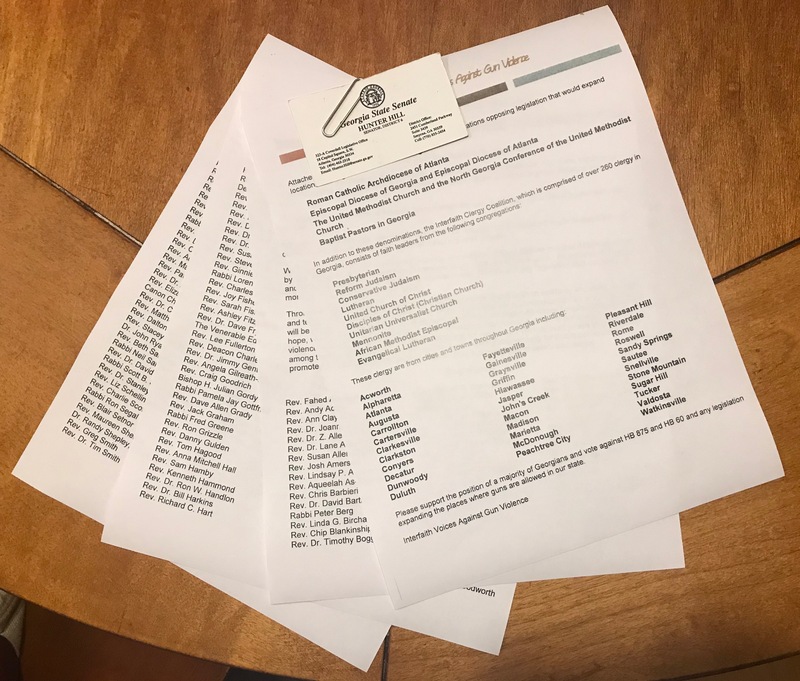 In his efforts to get this passed, he joined with OUTCRY (George Soros’ group of churches against the Second Amendment) and allowed his card to be attached to 4 pages of their literature, shown below asking Senators to “Support the position of a majority of Georgians and vote against HB 875 and HB 60 and any legislation expanding places where guns are allowed in our state.” After the church provision was changed he was seen high fiving other Senators. After hunting with suppressors was added to the bill, he voted for HB 60. On February 23 of this year, he stated that he felt there should be parity when purchasing a firearm and if the legal age to purchase a pistol is 21, then the legal age of purchasing a semiautomatic rifle should also be 21. He was called out on that and then stated that he made a mistake, that there should be parity in the ages but the age for purchasing a pistol should be lowered to 18. Also, a few weeks ago when confronted about the OUTCRY literature, he also said that was a mistake. Sorry, but true Second Amendment supporters do not make those types of mistakes. Posted in News | Comments Off on ​​​​GeorgiaCarry.Org ​strongly ​opposes Hunter Hill in Governor’s Race! GCO has filed a lawsuit against the Chatham County probate judge, Thomas Bordeaux Jr., for excessive delays in processing Georgia Weapons carry License applications. A copy of the complaint may be found here. The U.S. Army Corps of Engineers has granted permission to carry loaded firearms on Corps property to the two GCO members who sued the Corps for refusing to grant such permission. It is anticipated that such permission will be granted to other GCO members who request it and who have weapons carry licenses. GCO filed comments this week to the U.S. Army, Corps of Engineers, requesting the Army repeal its ban on carrying loaded firearms on Corps property. The genesis for the comments was an Executive Order signed by President Trump, asking all federal agencies to examine their regulations to reduce the burden on Americans. The Army solicited comments on its regulations for the Corps. The comments may be seen here.